The Research Strategy on Stress-resilient and Nutritious Maize is targeted at the development of fitter, more productive maize varieties and putting this improved seed in the hands of farmers. Why Stress-resilient and Nutritious Maize? In order to improve maize production, improve farmer livelihoods and insulate farming systems against the challenges of disease and climate, farmers to be able to find and use the improved seed they need in their local markets. MAIZE takes a three-pronged approach covering the entire spectrum from research and development, capacity-building, market development and collaboration with farmers themselves. 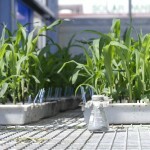 At CIMMYT, MAIZE has access to the most important collection of maize germplasm in the world. Working in collaboration with local and international partners, the most recent developments in breeding, genotyping, phenotyping and information-management systems are put to work, ensuring free public access to the genetic richness of this crop. New facilities such as at KARI-Kiboko in Kenya provide doubled-haploid breeding services to national researchers and local seed companies. MAIZE invests in research that identifies the challenges facing maize production, such as disease or a changing climate, and develops solutions in response. Important projects include Drought Tolerant Maize for Africa, Water-efficient Maize for Africa, and Nitrogen-efficient Maize for Ethiopia. The recent emergence of maize lethal necrosis (MLN) disease in eastern Africa is a key priority, with MAIZE CRP coordinating efforts to identify and deploy more resilient varieties. By building the capacities of national research institutions and smaller or community seed production enterprises, intervening to address weaknesses in the market chain, influencing policy-makers and raising awareness among smallholder farmers, MAIZE will ensure that the best seed is being used and continually improved throughout target regions in Sub-Saharan Africa, Latin America and Asia. 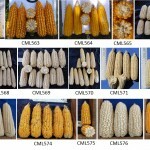 16 new maize lines have been released, adapted to tropical/subtropical maize production environments. Maize lethal necrosis disease poses an existential threat to maize production in east Africa, and is spreading rapidly elsewhere. MAIZE CRP is spearheading a response on all fronts. 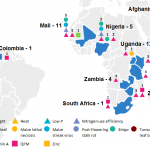 Map of varieties commercialized by MAIZE CRP partners in 2014, and key traits represented. Only available information is depicted.